Hamilton County, OH…….. Hamilton County Public Health’s (HCPH) WeTHRIVE! 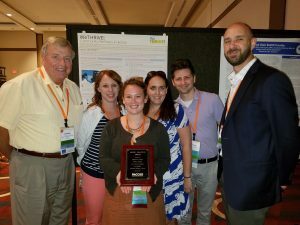 initiative was honored with the Model Practice Award at the 2017 annual conference of the National Association of County and City Health Officials (NACCHO). The award celebrates local health departments for developing programs that demonstrate exemplary and replicable best practices in response to a critical local public health need. WeTHRIVE!, launched in 2009, creates partnerships between communities and public health to generate broad-based support for creating healthy environments where residents live, work, learn and play. The WeTHRIVE! movement encourages long-lasting change through creation and adoption of community health and wellness policies. There are currently 21 communities throughout Hamilton County participating in the initiative. Communities develop working teams of citizens and leadership and select a “pathway” to target community health needs. Pathways include emergency preparedness, chronic disease, environmental health, injury prevention, social health and substance use/abuse. “The beauty of WeTHRIVE! is that it puts communities in charge of health,” says Tim Ingram, Hamilton County health commissioner. “Hamilton County Public Health provides data and organizational support for their teams, but ultimately, the communities drive long-lasting changes for their health improvement,” Ingram says. NACCHO’s Model Practice Awards honor programs, resources and tools that demonstrate how health departments and community partners can effectively collaborate to address public health challenges. WeTHRIVE! is now part of an online, searchable database of successful public health practices in areas ranging from immunization and maternal and child health, to chronic disease and emergency preparedness. To read more about these award-winning programs, visit:https://application.naccho.org/Public/Applications/Search. For more information on the WeTHRIVE! initiative, visit: www.hcph.org or http://www.watchusthrive.org/.